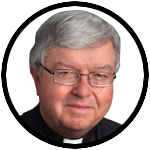 Q. I am a cradle Catholic and a product of 16 years of Catholic education. Thirty-seven years ago, I met and married a very nice Methodist girl. (The wedding ceremony was conducted in her church, with both her Methodist minister and a Catholic military chaplain officiating.) We have been blessed with four children who were all baptized Catholic. Now that the children are grown, my wife and I typically attend separate church services on Sundays, but occasionally (perhaps twice year) I will go to church with her or she will come to Mass with me. When she is with me at Mass, I usually remain in the pew with her at Communion time. But at her church, the minister regularly announces that all who are present are welcome to receive communion. A. Except for very limited circumstances, a Catholic is not permitted to receive communion at a non-Catholic service. The church’s Code of Canon Law provides that the faithful “receive them (the sacraments) licitly from Catholic ministers alone” (Canon 844.1). This is based on the Catholic belief that there is an unbroken chain of valid ordination from Jesus and the apostles down through succeeding generations of Catholic bishops, and that the same continuous line does not apply with Protestant ministers. A. The men you see in suits and ties protecting the pope — especially on trips outside of Rome — come from a variety of security forces. The storied 500-year-old Swiss Guard, clad in colorful uniforms when they guard the entrances to the Vatican, also have armed plainclothes members who travel with the pontiff. In addition, the Vatican has its own 130-member police force, the gendarme corps, who are assigned to accompany the pope. (Domenico Giani, the inspector general of this corps, is the pope’s personal bodyguard and is often seen off the front fender of the popemobile.) Also, on foreign visits, the host nation’s own security force — as per diplomatic protocol — is heavily involved in orchestrating the pope’s protection. I saw this exemplified in 1995 when St. John Paul visited New York City. I had been charged with managing the movements of the “tight pool,” the handful of videographers and still photographers who were given close-up access at each of the papal sites, and so I had a U.S. Secret Service agent assigned to me.